The forests of northern South America are the home of this beautifully colored ground snake. 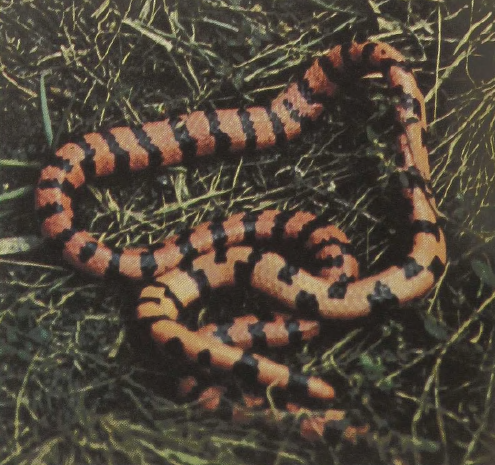 Related to the pipe snakes of Asia, and through them to the shield tails and to the boids, the South American Pipe Snake has a number of primitive characteristics. Among these are the very solid vertebrae and the heavy skull that let them tunnel through the soil and overcome small rodents and snakes by biting and constriction. These beautifully red-and-black-banded animals, which reach a length of about 30 inches, are fond of the water and some of their specializations may be aquatic rather than burrowing. When disturbed the snake spreads its ribs to the sides and flattens its body. Simultaneously, it waves its tail upward in a curve which displays the even brighter red and black ventral surface as a warning signal.